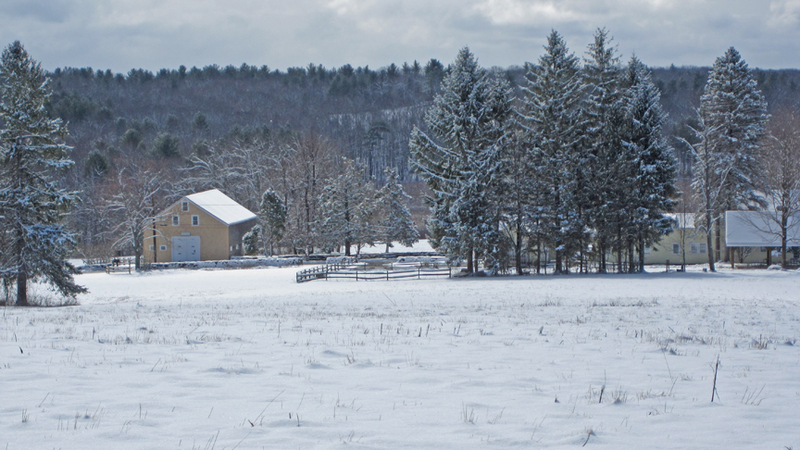 Posted on April 22, 2016 by Barry V.
This is the Horse Barn at Wachusett Meadow Wildlife Sanctuary, not far from my home. It’s the first day of spring, and through the night, six inches of fresh snow has cloaked the landscape in white. In the course of this mild winter, I’ve had precious few opportunities to paint winter landscapes with SNOW, and I’d like to have some in my Mass Audubon Residency portfolio. This may be my last opportunity, so I head down to Wachusett Meadow with my field kit. The sky is leaden gray and flurries are still coming down when I start this watercolor. I take special care to capture the close tonalities and soft shadows of a snowy day, and try to develop lots of soft edges to create the effect of moist, dense air. You can see a few sheep in the corral, and the open door to the lower level of the barn, where barn swallows zip in and out in summer to their nests on the overhead beams. Mass Audubon has recently done a lot of work on this structure. Large parts of the stone foundation have been rebuilt to shore up a sagging roofline, other parts have been re-shingled, and bright new barn doors have been added on the front. I’m happy to see venerable old New England barns treated with such care and respect! 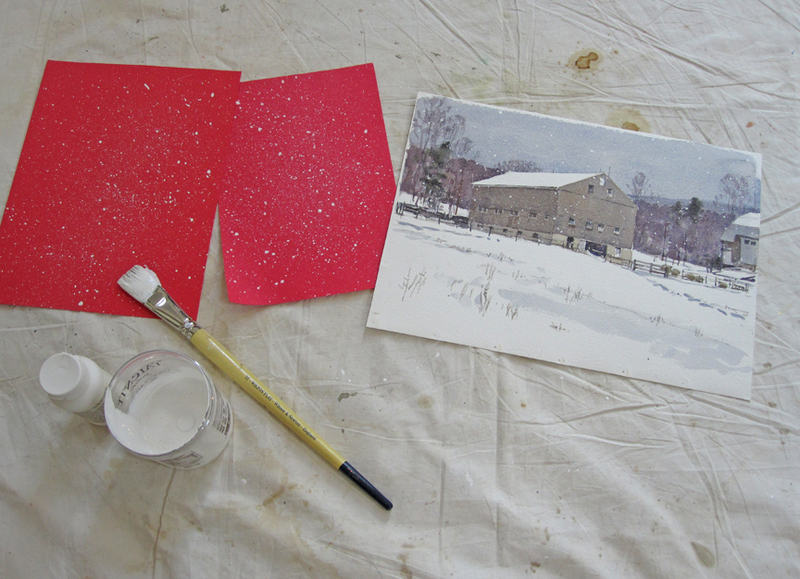 Later in my studio, I decide that I want an even “snowier” effect. I use a technique of spattering white droplets over the sheet to give the effect of a spring snow squall. I’ve found that acrylic Gesso works well for this – it’s very opaque, very white, and has some body to it for spattering with a large bristle brush. You’ve got to thin down the Gesso with water to get the right consistency, and perhaps this is the trickiest part. If you get it right, you’ll produce the right size droplets when flicked off the brush. Those red sheets of paper are my “test” sheets. I’m aiming for a mix of large and small droplets, since in a snowstorm you see larger flakes closer to you, and smaller ones further off. I’ve learned to use restraint with this technique, and yes, I’ve ruined a few good watercolors by overdoing it! 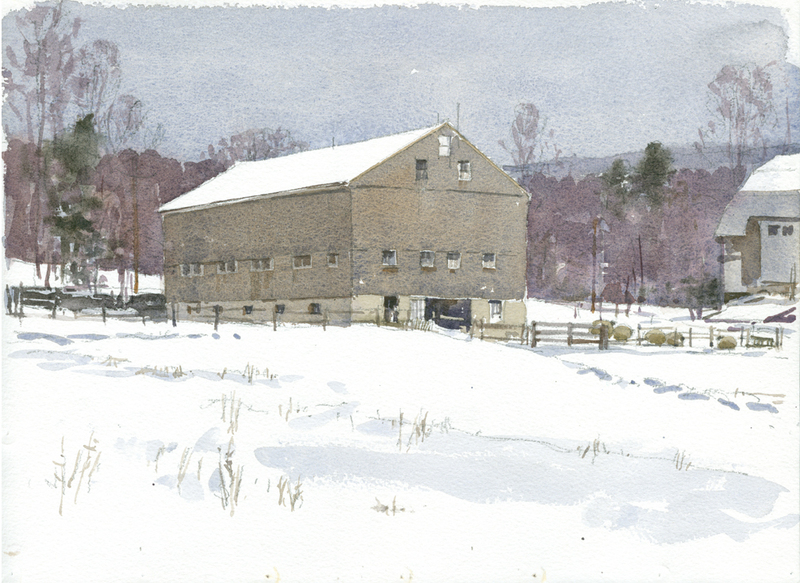 This entry was posted in Artists, Barry Van Dusen Residency, News and tagged acrylic gesso, barn swallows, Horse Barn, Horse Barn at Wachusett Meadow Wildlife Sanctuary, Landscape, Mass Audubon, snow, snow landscape, snow squall, splattering effect, Wachusett Meadow on April 22, 2016 by Barry V..